Let the stress of the day go the instant you slip on the Tribecca. 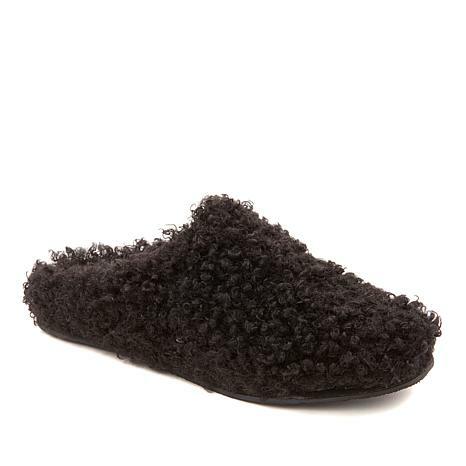 Plush curly lamb faux fur and a wool-blend lining beckon with the promise of cozy comfort for tired feet. Easy on and off and these are nice and warm. They are now put away for next winter as it is now too warm for these . Had to replace a old women out sheepskin slippers . Really like these slippers, they are the cutest and look great but the best us how warm they keep your feet, adorable. I am a fuzzy slipper fan. These are the awesome! Well made and I love the foot bed, Just enough support for a slipper. Soft, and foot fitting. I have a average/medium width foot and the fit is perfect. My feet are warm, but not overheated. I am a happy camper. I purchased these slippers as a Christmas present for myself. When I saw them I thought there's no I could go wrong. I threw away the box, which is something I rarely do. I thought I was going to love these slippers. Nope, I made a big mistake. They are not comfortable. They make my feet sweat and I feel like I'm walking on a brick. If I had the box they would've been returned immediately after Christmas. BarePaw totally missed the mark on this one.